Antonio Santi Giuseppe Meucci was born in Florence, Italy, moving to Havana, Cuba in 1835 and relocating to New York in 1850. Employed as a customs officer, his revolutionary activities led to his incarceration in 1833 and 1834 with the Italian patriot F. D. Guerrazzi. Shortly after his release Meucci left for Havana, Cuba. 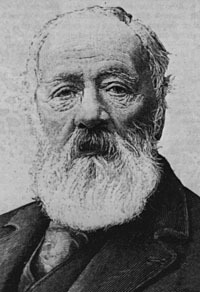 Meucci discovered the principle of the telephone in 1849 and developed a working model by 1859. The Meucci circuit diagrams, notarized in September 1885 (though dated 27 September 1870), clearly predate the work of Pupin, Campbell, Heavyside and Vaschy, and the later-contested Alexander Graham Bell patent. Giuseppe Garibaldi, exiled from Italy in 1850, arrived in New York two months after Meucci, who gave him work in his candle factory in Clifton until he returned to Italy in January 1854. Registering at least eleven patents, among other accomplishments Meucci established the first stearic candle process in the Americas in 1850-51; the first electroplating factory in the Americas, established in Havana, Cuba in 1844; and the first paraffin candle factory in the world, the New York Paraffine Candle Co., set up in Clifton, NY, early in 1860. On June 15, 2002, the USA Congress, by House Resolution 269, officially recognized the work of Meucci in the invention of the telephone. In response, on June 21 the Canadian Parliament passed a unanimous resolution recognizing Alexander Graham Bell as the inventor of the telephone. Source: Antonio Meucci: The Inventor and his Times, Basilio Catania. (Vol. 1), Seat - Divisione STET, Editoria per la Comunicazione, Rome, 1994.